At Parkdale Elementary, 3,800 sf of new library and computer lab spaces were added to an existing facility built in the 1940s. 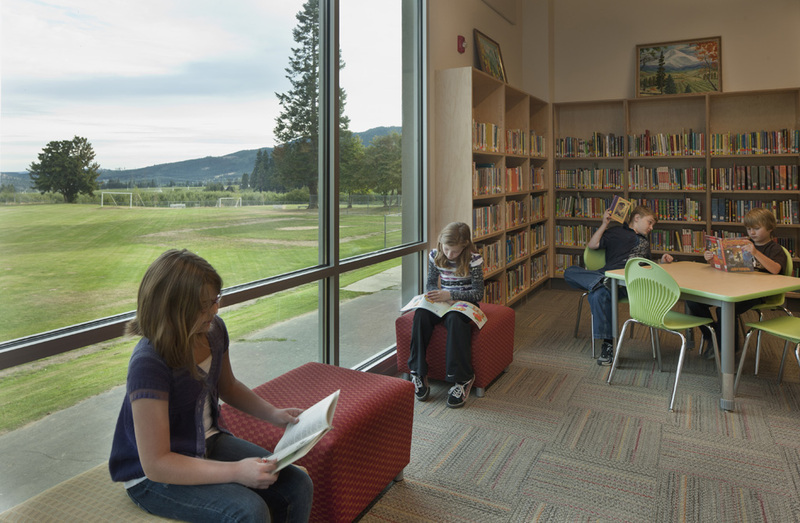 The new facilities are tucked into a U-shaped courtyard allowing the computer lab to have good daylighting while avoiding glare, while the library combines a warm, wood-finished space with magnificent views of Mount Adams across the Columbia River Gorge. The building opened for classes in September 2010. The addition brings together two active, growing and community-oriented spaces, which were originally located at opposite ends of the building. With a goal of creating a community space and maintaining a sense of openness, the interiors focus on transparency, flexibility and warm materials. With a limited exterior wall, the design maximizes the views of Mount Adams with floor to ceiling windows across the north end of the library. A deliberate connection between the library and computer lab is made through windows that bring the spaces together. Sailcloth diffusers soften the light through multiple skylights in the library and computer lab, eliminating glare in the space.